Booming thunder shakes your home to its core as the winds screams past your house. Pounding rain hammers on your window, and yet it goes unnoticed as you continue along with your day. To you, this storm is another common occurrence, but for your roof, it could be a disaster. 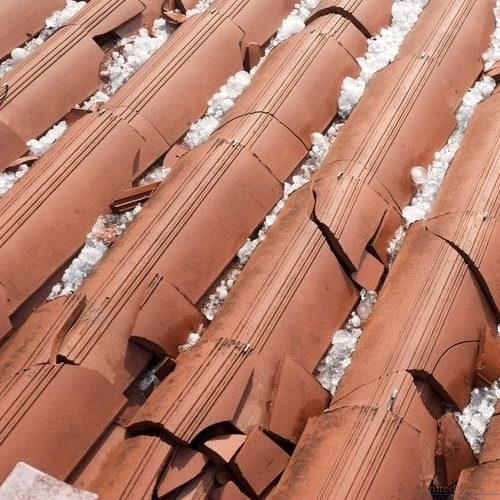 Roof storm damage is a common threat for homeowners and it can go unnoticed until a larger problem, such as a leak, occurs. If you suspect your roof has suffered from storm damage than it is essential that you get in contact with a roofing specialist immediately. If you are looking for a roofing specialist in the Grain Valley and Kansas City, MO to help you with your storm damage, than call the team at United Roofing Services. You can receive an estimate by calling __PHONE__. It is always highly recommended that you get your roof inspected after every storm. Whether you do this yourself or hire a professional roofer to help you, it is important to know the warning signs that your roof might be in trouble. Here are a few things you need to check for, in order to ensure that your roof is still holding strong. The first place you want to look to inspect your home for storm damage is outside. Pay particular attention to the state of your yard and car in order to check signs of debris or denting. Denting of your car and debris scattered across the yard are good signs that damage has probably occurred to your roof. If you notice shingles thrown about your yard, this is a red flag that shingles have become detached, leaving bald-spots on your roof. Once you have fully investigated your car and yard you can move onto the home itself. Inspect flashing on your roof for signs of denting. Dents in your flashing create weak spots, as it leaves an opening for water to get into the vulnerable spots and pool there, creating the potential for a leak. If you notice that there is denting, or in severe cases, warping of your flashing, it is extremely important to get a roofing contractor to repair the damages. Gutters are responsible for moving excess water away from your roof and home. When debris or dirt get lodged into the pipes it causes the back-up of water which can damage the pipe due to pressure and even leak onto your roof. It is also important to note that finding debris in your gutters is another potential sign of debris hitting your roof, which can cause dents, damaged shingles, and even displaced shingles. If you notice chunks missing in your brick or the chimney is leaning, this could mean that hail or strong winds have threatened its integrity. Warped soffits and fascia are a sign that a leak has occurred, or there is a lot of pressure from the gutter, most likely due to a clog. Leaks can be caused by decaying lubber or broken seals in between the soffit and the fascia, resulting in excess moisture becoming trapped. In order to maintain the integrity of your home, and keep animals from making a home in the opening of the soffit, it is important to get these problems repaired right away. If you don’t feel comfortable going up on top of your roof, not to worry. You can take note of your shingles while standing in your front yard. One of the other important things to take notice of is the state of your shingles. Curling, dents, or bald spots are all cause for alarm. These problems leave your roof vulnerable to leaks and even has the threat of sustaining puncture damage to the underlayment of your roof. Don’t ignore these signs and call your professional roofer right away. If you live in Grain Valley and Kansas City, MO then you can trust the expert roofers at United Roofing Services to help you with all of your roof repair needs. Call us today at __PHONE__. Inspecting the inside of your home can help you tell if the storm damage on your roof has caused a leak. Look for signs such as, stains or bubbling in the ceiling or walls or signs of mold and mildew. Does My Insurance Company Cover Storm Damage? Typically your homeowners insurance will cover damages to your roof caused by storms. Hail, lightening, and wind damage fall under the category of natural disaster, which is pretty universal for all insurance policies. In order to be completely sure, it is important that you go over your insurance policy, and make sure you understand all of the fine print. While a roof leak is covered under storm damage, a few missing shingles are generally not, as they are considered cosmetic damage. 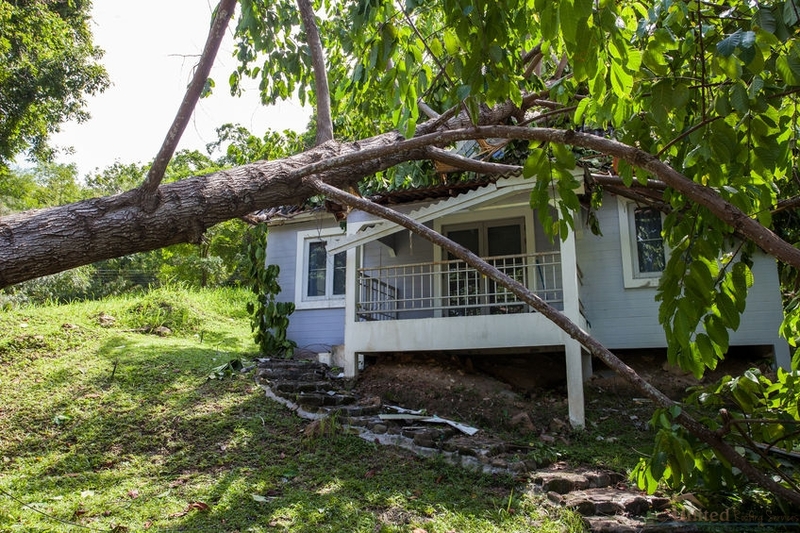 When you notice storm damage, it is important to file your claim right away, as ignoring it and allowing the problem to grow, can end up voiding your coverage. Damage that is a result from a preexisting condition is known as lack of maintenance and not storm damage. No matter what damages there are to your roof, you can rest assured that the team at United Roofing Services can help you with your repair and replacement needs in Grain Valley and Kansas City, MO. Call us today and we can help you repair and reinforce your roof so that way, it can withstand the next storm and keep you safe. Call us at __PHONE__ to receive a consultation! Posted in Uncategorized on February 22, 2019 at 8:46 pm by United Roofing Services. Find Out If You Need a Re Roof Or Roof Replacement. When you have a roofing system, the most common service that will be done is replacing the roof. Most people believe that when their roof has reached its lifespan, the next step is to get a roof replacement. The truth is, you need a roof replacement when the roof materials and the sheathing underneath are damaged. If your roofing system is past its prime but the sheathing isn’t damaged, then you can be eligible for a re roof. A re roof is when new roofing material can be installed directly on top of the old roofing. Re-roofing a house can only be done one time because you can’t just keep adding layers of roofing. The reason is that the weight of the roofing material can become too heavy, therefore causing structural damage to a home. Another thing to mention is that re roofing is not going to work on every house. If you are wondering “should an old roof be removed?” If only a portion of your roof needs to be replaced, when you’ve already had a re roof done, or there are damages to the roof deck below the roof shingles. For people who are wondering, “Is it OK to put a new roof over an old one?” the answer is yes, but the damages can’t be too serve, your roof can’t already have had a re roofing, and the whole roof will need to be re roofed. Roofers who are performing re roofing on a home need to have the correct materials; without the right materials, the re roof is not going to work as it should. Here are some of the re-roofing materials list that will be needed. All of these things are going to be needed if you are trying to attempt re roofing your home. Our biggest advice is to hire a professional roofer. When you are getting a Trane heating system installed, you don’t just do it yourself–you get a professional HVAC technician to install it for you. The same can be said for re roofing. While it might be cheaper for you to do it yourself, that doesn’t mean it’s going to be done correctly. It’s always a good idea to pay a little extra to ensure that your re roof is done properly. It can be hard to know when you need a new roof and a re roof. A lot of people will ask, “How do I know when my roof needs to be replaced?” There are a couple of reasons why someone might need to get a roof, which includes the age of the roof, there are a ton of missing shingles, your chimney flashing is corroded, there are granules in your gutter system, and the shingles are curling or buckling. Another question that people will ask in regards to roof replacements is, “How often should you replace your roof?” and the answer is that it’s going to depend on the roofing system. If you have an asphalt shingle roof, the roofing doesn’t need to be replaced for 15 to 30 years; with a metal roof, the longest you can go without a roof replacement is 75 years. When considering a re roofing, it’s important to know what the benefits are. This is because a re roof might not be what you think it is, and a roof replacement might be the better service for your roof. Here are some reasons why someone would choose a re roof. The roofing system is past its lifespan but the roof itself is in good shape. If you are needing to get the entire roof redone, a re roof is a good idea. How much does it cost to re roof? Around $7,000 which is significantly lower than a completely new roof. It is going to be a lot easier than replacing the entire roof. It is going to be a lot faster than replacing the entire roof. You will look like you have a brand new roof without having to rip all of the roof shingles off the roof. If you think that re roofing is the best and most logical option for your roof, then you will need to know a few things. First, know that re roofing can be a liability, so it’s important to read all documents pertaining to the service. You will need to know what kind of roofing materials can be used in a re roof, as well as the color that you want the roofing material to be. While re roofing is very fast and easy, it can still be noisy, so that is something to be aware of. Lastly, find a roofing contractor who has experience with re roofing. If you are thinking about getting Re-roofing in Kansas City, MO, please call United Roofing Services at 816-228-1158. We are ready to provide your home with a new roofing system without all of the hassle of a complete roof replacement, so call us today! Posted in Uncategorized on December 21, 2018 at 10:02 pm by United Roofing Services. Metal Offers Fantastic Weather Protection and Durability as a Re-Roof Material. Metal roofing has long enchanted homeowners with its promises of strength and simplicity, but is it really worth the investment? Industry professionals sure seem to think so. Today, we’ll talk about the many benefits of metal and how it works as a re-roofing solution. We’ll also dive into some of the frequently asked questions regarding metal roofing! Afterwards, you will be equipped to decide whether or not metal roofing should work for your roofing needs. The majority of homeowners that choose metal roofing do so for its impressive strength and durability. It takes an unusually powerful force to puncture, tear, or even dent metal. The vast majority of severe weather systems simply won’t harm metal paneling. Compared with other premium roofing solutions, metal panel roofs come with a simple, fast installation process. Assuming the work is completed by an experienced team, you can expect many years of strong and stylish protection for your family! Metal roofing insulates your attic against the temperature outside, whether you’re in the middle of a sizzling July or a frigid January. That means your heating and cooling system won’t have to compensate as much for lost conditioned air. Considering your HVAC system accounts for almost half of your home’s daily energy consumption, your family would likely save thousands of dollars in heating and cooling costs through the course of your roof’s lifetime. Don’t just take our word for it though! See what the US Department of Energy has to say. Finally, customizing your roofing system is a blast with metal roofing! There are countless options for paints, textures, and finishes that can provide a unique aesthetic for your home. Want to metal roof coating with stone? Great! Thinking about mimicking natural slate instead? Fantastic! Homeowners can have a lot of fun finding a style that matches their personal flair. Sure, a shingle roof will provide a plenty of value for a very accessible cost. Is a metal roof better? Yes! Why Install Metal Roof Panels Over My Old Shingles? Metal is an Ideal Re-Roofing Material Because of it’s Durability and Longevity. Re-roofing allows your family to delay the tear off process, which would normally cost (at least) a thousand dollars for labor and disposal. For homeowners re-roofing with another layer of shingles, that delay might only be 20 years, maybe less. With a top layer of metal roofing however, your family may avoid tear-off for 50 years or more. With the durability of metal, you’re also far less likely to run into any maintenance problems. 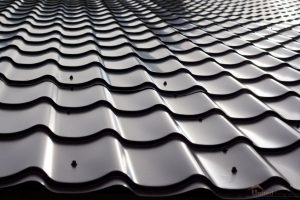 What Makes a Metal Roof Ideal for Re-Roofing? Metal offers an exceptionally easy re-roofing process that’s almost as simple as a shingle re-roof. However, a shingle re-roof system will be just as vulnerable to hail and wind damage as it was before, while a metal top layer provides stronger weather protection on top of fantastic energy savings. With a metal re-roof, you also don’t have to worry about the underlying layer creating bulges in the panels. There was a time when tin roofs made a distinct clinking noise every time it rained. Nowadays, roofers install a thick layer of sheathing beneath the metal panels that greatly diminishes sound. You won’t have to worry about excessive noise during thunderstorms, because metal roofs are actually quieter than other types of roofing materials. When the cold rain falls heavily upon your roof at night, you’ll still be sleeping like a baby! Can Metal Roof Be Installed in Winter? Unlike other forms of roofing, metal needs no additional time to seal or cure. The insulating effect of metal roofing (plus its moisture repelling nature) make it simple to install during the winter time. You won’t have to worry about ice or snow warping the metal. Simply put, metal roofing (steel, aluminum, copper, or zinc) will stand up to any sort of weather challenges. Metal Does Not Attract Lightning More or Less Than Any Other Roofing Material. Because of metal’s conductive nature, many homeowners worry about the roofing attracting lightning during a thunderstorm. They believe instead that a non-conductive material, such as wood shakes, would be safer in the event of a strike. Nothing could be further from the facts. The structures most likely to be impacted by a lightning strike are those elevated above their surroundings (such as skyscrapers), but lightning often prefers to strike thin objects (like poles or weather veins). In short, the larger a building and the more elevated it is compared to its surroundings, the higher the chance that lightning will strike. When a bolt connects with a building, the current should immediately passes through the materials into the ground. There is an off chance that the strike could generate a fire if the roofing material is combustible. Since metal is fire-retardant (it doesn’t catch fire), it’s actually a much safer option than other forms of roofing (especially wood) when it comes to thunderstorms. Normal asphalt shingles may last for up to 25 years, at best. That lifespan can easily be cut short by a severe hail storm. Metal roofing, on the other hand, lasts anywhere from 50 to 70 years with good maintenance. Enhanced durability means you won’t have to worry about wind or hail impacting your roof’s longevity. For many homeowners, installing a new metal roof means investing in the last roof they’ll ever need. Do Metal Roofs Need Maintenance? Not very much. As we’ve already talked about, metal roofing is extremely durable. It takes an exceptionally strong force to even dent metal paneling, let alone puncture it. In the event some sort of accident or tree collapse damages part of your metal roof, the only repair needed is a quick panel replacement. That being said, metal (especially aluminum) does start to lose some of its reflective sheen over time. 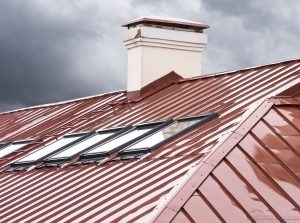 This can be remedied with a simple re-coating, which your local metal roofing company can quickly perform. The process will also reinvigorate your roof’s corrosive resistance. The only other form of maintenance your roof may need is tightening in the fasteners, once every decade or so. Schedule Your Consultation for Metal Roofing! Need more details about professional re-roofing or how metal paneling would work for your home design? Our roofing experts at United Roofing Services would love to talk with you about your upcoming project. Ask all of your questions! Give our team a call today at 816-228-1158 and learn more about metal roofing in Grain Valley and Kansas City, MO. Posted in Uncategorized on October 24, 2018 at 8:27 pm by United Roofing Services. 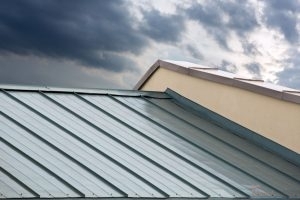 Metal Gutters Have Become the Norm for Homeowners Nowadays, But Even They Need Repairs Sometimes. Gutter repair is like garbage disposal repair: you rarely think about it until its clogged with gunk. Damaged gutters can lead to a world of hurt, especially in environments with heavy rainfall. To guide you on your path to gutter repairs and replacement, here’s a helpful little guide! When is it Time to Replace My Gutters? Many problems with your gutter system are easily fixable. Loose gutters can be tightened against the fascia board. Disjointed gutters can be mended. Even frequently clogged gutters can utilize a debris shield to avoid further issue. When your gutters become degraded however, that is the time to look for replacements. Sections with numerous holes or severe corrosion should be replaced immediately. Just like any part of your roofing system, broken gutters actually divert water towards your home. Your budget and design goals will determine which material should best serve your needs. Copper and zinc are perfect for high budget projects, and they both develop a nice sheen over time. On the other hand, steel and aluminum both offer capable functionality for much less. Vinyl gutters are even less expensive, though they are more vulnerable against extreme cold and ladder weight. If you’d like assistance with Kansas City, MO gutter installation or replacement, our team at United Roofing Services would love to help! Give us a call today at 816-228-1158 for your estimate. Posted in Uncategorized on September 18, 2018 at 8:10 pm by United Roofing Services. Roofs are fundamental to keeping your home or business protected from sun and storm damage. While getting the cheapest option might seem the most tempting, it will actually end up being the most expensive over the long haul. Asphalt shingles are the most affordable roofing option at around $20,000, but only last 20 years maximum. They easily get damaged from wind and hail, requiring costly repairs during its lifespan. Opting for a more expensive roofing system upfront will mean no maintenance over its much longer lifetime. This saves you thousands of dollars in replacement and repair fees. 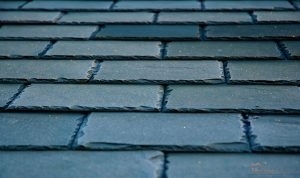 Popular and long-lasting premium roof choices are slate, tile, shake, and synthetic. One of the brands of roofing materials that we carry provides all of these types of premium roofing systems. If you are interested in upgrading to a premium roof in Grain ValleyGrain Valley and Kansas City, MO, call the roofers at United Roofing Services at 816-228-1158 today. Extremely durable: all premium roofs can withstand severe rain, hail, snow, and wind storms. All premium roofs but real wood shake roofs are also fireproof. Synthetic fireproof wood shake roofs are available. Posted in Uncategorized on August 15, 2018 at 7:01 pm by United Roofing Services. 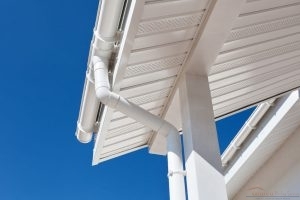 Why is Summer Gutter Service Important? Gutter Service Can Keep Your Roof And Home At Its Best. There are many aspects and materials that help keep your home structure and roof at their best. 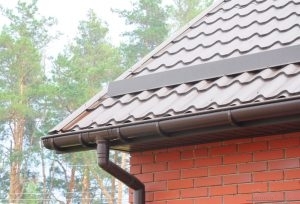 One such aspect is your gutter system which lines the area of your roof, resting along the fascia board. This system carries water away from your home, dispersing it carefully so that no damage comes to your property. When damaged or not functioning correctly, it can allow water to streak down the side of your home, wear at your fascia, and damage your roof. Summer is one of the best times to get your gutters repaired and serviced, but many homeowners forgo this. Consider the following reasons why getting summer gutter service is so crucial to your home. 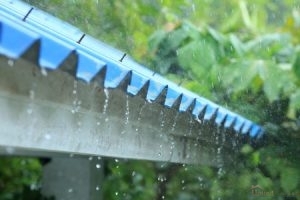 Take Care Of Damage From Spring: Spring storms can be very hard on gutter systems. All the water and debris that pass through your gutters can wear at it and damage it over time, but if this past spring was especially difficult, it can accelerate the damage. Getting repair can get your system back to its best. 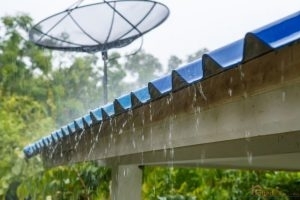 Make Sure Your Gutters Can Handle Summer: While spring may be known for storms and rain, summer has high heat to contend with. If your system is already damaged, heat can cause cracking and paint peeling, as well as other problems. Having a contractor take a look can determine if your current gutters are able to handle the upcoming season or if they need replacement. Get Your Gutters Ready For Fall: Finally, having gutter service can ensure that when fall comes, your system is ready. Fall comes with lots of leaves and debris that collect in your gutters. Making sure your gutters won’t be clogged easily and that they can handle what comes their way will ensure your home is safe year round. United Roofing Services understand that when you need gutter service, you expect professional quality repairs. Our team of experts is always available to provide you with quality repair and installation gutter service in Grain Valley, MO. When you are ready to get started, give us a call at 816-228-1158. Posted in Uncategorized on July 13, 2018 at 2:23 pm by United Roofing Services. Missing and Damaged Shingles Often Indicate the Need for a New Shingle Roof. Asphalt shingles represent the premier choice among roofing materials for United States homes. Homeowners appreciate not only the low price of shingles, but also the decent durability and ease of repair. As a matter of fact, a properly maintained and installed shingle roof can last for 20 years. Eventually, however, every shingle roof will need replacement. As a homeowner, you should stay mindful of the signs that indicate a need for a new shingle roof. While small amounts of damage can benefit from repair, widespread issues mean that you need a new roof. 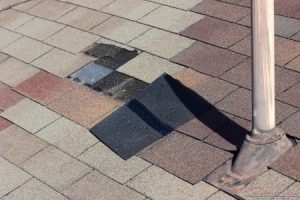 Shingles can crack, curl, and crease, problems that create the potential for serious leaks. A particularly strong storm can batter a shingle roof with hail or windblown debris. If you ever inspect your roof and notice an abundance of damaged shingles, call for a professional inspection. High winds can actively tear shingles off of your roof. 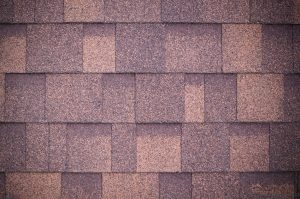 When you find shingles on the ground, or notice their disappearance from your roof, you should use the same logic that applies to damaged shingles. A few missing shingles here and there can be replaced. If you’ve lost a lot of them, however, you’re better off with an entirely new roof. Age represents the top reason for shingle roof replacement. A shingle roof that has surpassed 15 to 20 years of age may look perfectly fine. In reality, it probably harbors hidden damage and wear that make it highly susceptible to failure. If your roof has served admirably across the material’s average lifespan, call for an inspection to determine its continued viability. At United Roofing Services, we are your local experts for a new shingle roof in Grain Valley and Kansas City, MO. If you have any questions or service requirements, don’t hesitate to call us today at __PHONE__. Posted in Uncategorized on June 8, 2018 at 4:16 pm by United Roofing Services. Metal Roofing Can Provide a Plethora of Benefits To Your Home. When you are researching the benefits of having a metal roof installed for your home, you may come across some conflicting information on the advantages. While the internet is a fantastic place to do research before making a decision on your roofing system, sometimes the information available can be based on conjecture or from long-standing myth. At United Roofing Services, we want to dispell some of these fictions to help you make the best decision for your home. Below are the top three metal roofing myths and the truth behind them. 1. Having a Metal Roof Increases the Chance of a Lightning Strike. As many people know, metal is a conductor of electricity. This has to lead to many people believing it can actually increase the likelihood that your home may receive lightning strikes. However, metal does not actively draw lightning to it, meaning you have just as much of a chance with a metal roof as any other roof. As opposed to other materials, if there is a lightning strike, metal can take it better and will not combust. 2. Rain on Your Metal Roof Will Be Very Loud. Rain can be a soothing sound, however many people fear if they have a metal roof it will be excessively noisy and disturbing when it rains. This just isn’t the case. For many homes, metal roofing is installed over the attic which acts as a dampener between your living space and the roofing system. With this space, it is no louder than it is normally when it rains with any other roofing material. 3. During the Winter, Your Metal Roof Will Make Your Home Colder. There is a myth that metal roofs perform poorly during the winter months and will actually leave your property cooler in the winter than any other roof. This is not at all true. A properly installed and vented metal roof will be just as efficient as any other roofing system. However, if your home does seem cooler, you may want to investigate your insulation. This helps regulate your internal temperature so you may need more. United Roofing Services installs metal roofing systems for homeowners in Grain Valley, MO. Want to get started on your metal roofing installation? Call 816-228-1158 today! Posted in Uncategorized on April 2, 2018 at 3:10 pm by United Roofing Services. As winter comes to an end, the spring rain will begin and when that happens you’ll want a fully sealed roof over your head. That transitionary period of winter snow melting turning into the rainy days of spring will result in a lot of moisture on your roof. Which is why we start seeing a lot more calls for leak repairs. Leaks can cause a lot of damage to your roof and inside your home. 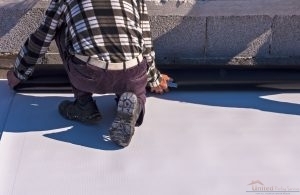 So it’s best to be prepared and ensure that your roof can resist all the rain and melted snow. Spring rains can also mean spring storms, and high winds and hail can triple the threat of leaks. If you notice any dents or missing shingles, call a roofer right away to have the damage repaired. Keep in mind that if you’ve had leaks in the past, and the roof hasn’t been replaced you stand a good chance of dealing with more of them. An aging roof is more susceptible to leaks because the roofing materials will have deteriorated and weakened further under any snow. If you have a roof that is clearly past its typical lifespan, we recommend having it replaced with a new, hardier roof system. Getting your roof inspected is the best way to prepare for any trouble with your roof, and even have susceptible areas fixed before they can wreak havoc on your home. While you might consider waiting on an inspection to see how your roof fairs through the Spring, keep in mind that early inspections and repairs can save you a lot of money by avoiding costly repairs inside of your home as well! To get a roof inspection in Grain Valley, MO, contact United Roofing Services today at 816-228-1158! Posted in Uncategorized on February 28, 2018 at 5:10 pm by United Roofing Services.